Syllabus: Click here for my Criminal Law syllabus from Spring 2014. Syllabus: Click here for my Evidence syllabus from Fall 2014. Syllabus: Click here for my Introduction to American syllabus from Fall 2017. Syllabus: Click here for my Law and Artificial Intelligence syllabus from Fall 2017. I teach an upper-level course at the University of Minnesota Law School entitled Law and Neuroscience. The course description is: What are adolescents, psychopaths and white-collar fraud artists thinking? Why does emotional trauma for victims of abuse last so long? Whey is eye-witness memory so poor? Do violent video games lead to violent children? How can you get into the heads of the judge and jury? 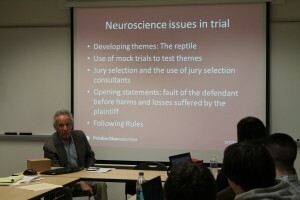 Lawyer and courts, including the U.S. Supreme Court, are already integrating neuroscience research into their arguments and opinions on questions such as these. This class will introduce the exciting new field of “neurolaw” by covering issues such as neuroscience of criminal culpability, brain-based lie detection, cognitive enhancement, emotions, decision making, and much more. Along the way we’ll discuss how the legal system can and should respond to new insights on topics as adolescent brain development, addiction, psychopathy, Alzheimer’s, effects of combat on soldiers’ brains, and concussions from sports injuries. Note that all scientific material in class will be presented in an accessible manner, so no previous science background is required. The course utilizes the Law and Neuroscience coursebook (2014, Aspen Publishers) that I co-authored with Owen D. Jones and Jeffrey D. Schall, both of Vanderbilt University. You can download a sample chapter here. 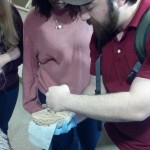 The course also integrates guest speakers, a field trip to the Center for Magnetic Resonance Research, and an opportunity to get up close and personal with a real (dead of course) human brain. 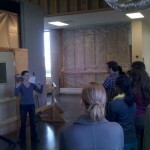 Dr. Cheryl Olman takes the class on a tour of the University of Minnesota’s amazing Center for Magnetic Resonance Research (CMRR). Dr. Adam Steiner shows students what a real human brain looks like during our class on brain structure and brain function. The Twin Cities are home to leading medical device companies like Medtronic. 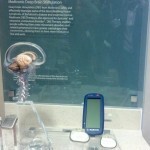 We took a field trip to visit the Neuromodulation group. 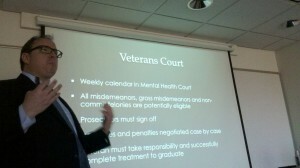 Attorney Brockton Hunter, a graduate of the University of Minnesota Law School and a national expert on veterans law, spoke about veterans in the criminal justice system. Attorney Fred Pritzker, a graduate of the University of Minnesota Law School, is one of the top lawyers in the Twin Cities and he spoke about litigating brain injury cases. In Spring 2012 I taught an upperclass seminar at Tulane University Law School entitled Education Law and Policy. The course was described in this way: The Supreme Court has famously said that “education is perhaps the most important function of state and local governments,” and Americans consistently rank K-12 education as the one of the most important issues they want policymakers to address. Yet K-12 education is also one of the nation’s most contentious policy arenas. Education law stands at the center of these policy debates, and in this seminar students will be exposed to the many ways in which K-12 education is shaped by law. Topics to be covered include: the structure of education law and governance; the distinctions between public, private, and home schooling; the interplay of federal, state, and local laws; religion and public schooling; charter schools and school choice vouchers; school boards; segregation; students’ rights; and teachers’ rights and teacher unions. In addition to case law, students will consider policy perspectives on school reform. Special emphasis will be placed on K-12 reforms within the greater New Orleans area, several guest speakers are planned, and students will be encouraged to link law and real-world education policy. Students will be required to complete a paper (minimum 25 pages), as well as be active participants in seminar discussions. In 2008 I created and taught an original junior seminar in the Harvard Government Department entitled How to Win Elections. The course was described in this way: Want to run a campaign? Run for office yourself? If so, you’re going to need to make decisions: Do you go negative? Do advertise on television or send out flyers? How do you frame the issues? How should you harness the power of the Internet? How will you tell whether any of it is working? The tools of political science can be used to answer questions like these, and in this course you will learn how. In 2007 and 2008 I led sections of “Gov 99”, the workshop for seniors in the Government Department who are writing theses. I went on to serve as Assistant Director of Undergraduate Studies for the Harvard Government Department, a role which allowed me to help reshape our senior thesis writing curricular support. In Summer 2008 on the campus of Yale University I taught a 3.5 week intensive introductory course in American Politics as part of the Junior State of America (JSA) Summer School for high school students on the campus of Yale University. The course met 3 hours per day, 6 days a week. The course was described in this way: So you want to change America? Good. So do I. And to do it, we’re going to have to work through the political system. If you can understand, and then master the workings of government and politics you will be in a remarkably powerful position relative to your peers. Whether you want to run for office, generate new policy proposals, make existing policy more effective, change the laws, or prevent the laws from changing, you need to know how the system works. In this course I will introduce you to the system, with a special emphasis on how political power is gained, lost, and maintained.